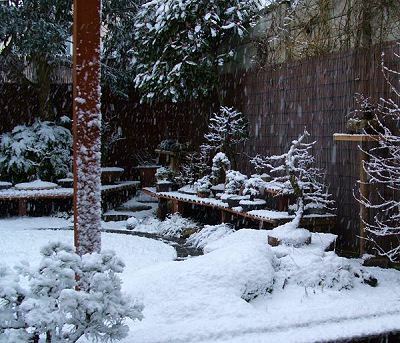 Most species of bonsai and nearly all temperate climate woody plants require the cold. During the Autumn, as daylight hours become shorter and temperatures drop, trees react by hardening up their immature growth. Stem tissues begin increasing their levels of sugars and carbohydrates which by the time the first frosts arrive, act as an antifreeze to ensure that the plant itself will not freeze. Deciduous species lose their leaves to reduce moisture loss and all growth stops for 4 or 5 months. (Coniferous species have thin, waxy needles that reduce transpiration to a minimum and this allows them to stay evergreen). Eventually as winter arrives, trees have completed their natural defensive system against the cold of winter; dormancy. In the Spring as temperatures rise, new buds on the trees will start to extend and unfurl their first growth in Spring, completing an entire years’ growth cycle. Some bonsai beginners feel that their trees may perish if subject to the harsh conditions of the winter months and bring their trees indoors to ‘protect’ them. This continuation of heat and light through the winter prevents dormancy in temperate trees. The resulting continual growth throughout the year goes against the trees’ internal clock which is requiring a dormant period, the clock can be tricked to an extent; the tree will continue to grow inside. It may even grow continuously for as long as two years after which, whatever the season or conditions, deciduous species will drop all leaves and evergreens will stop all growth. This out of season dormancy usually results in very sickly trees and even death. HOW LONG A DORMANCY DO TREES REQUIRE? For areas with mild winter temperatures, providing a natural winter dormancy can be difficult;it should be noted that all temperate woody plants require a dormant period where temperatures drop to less than 10C continually for a period of between 260 hours and 1000 hours (depending on individual species). This equates to a dormant period of between 11 days and 42 days of continual sub 10°C temperatures. The only exceptions to this need for dormancy are tropical and subtropical species. These are outdoor trees only during the warm summer months in many temperate areas of the world. To keep them outside during the winter would be fatal. Tropical and subtropical trees have very modest dormancy requirements and in their native habitats are capable of continuous growth all year round at 20°C or above. For this reason tropical and subtropical trees are resilient to indoor growing conditions during the Autumn, Winter and Spring. The truth is that nearly all temperate woody species are reliably hardy down to -10°C (15F). Below this temperature all that is required is some protection for the root system which is not as frost hardy as the top growth. To become reliably hardy to these temperatures, trees must fully harden up in the Autumn by being grown outside. Trees are able to survive sub-zero temperatures by virtue of being dormant. Trees that are purchased during the winter should be kept in similar conditions to those that they had been kept in by the retailer, even if this was indoors. To put a tree outside in the middle of winter when it has previously been grown indoors and is still active would kill it. The rootsystems of our bonsai are the most susceptible part of the tree to damage from the cold. In nature, a trees roots’ are buried into the ground and are rarely subjected to freezing temperatures. Whilst the surface of the ground may freeze, this will only affect the top few inches of the soil. Below this the cold is unable to penetrate deep enough to freeze and the trees’ rootsystem remains unaffected by the above ground temperature. Bonsai however, have their entire rootsystem above ground level in an often shallow pot where the soil is easily affected by prevailing air-temperatures. The top growth of trees in nature however, is subject to the full force of winter and is able to withstand temperatures far lower than the rootsystem ever could. Though the rootsystem hardens up in the Autumn, it is to a lesser extent than the topgrowth. Damage to topgrowth only usually occurs when the ambient temperature rises during the day whilst the water in the ground or pot is still frozen. This situation can often arise in greenhouses during the winter and also outside in areas where there are large fluctuations in temperature between day and night. As temperatures rise the leaves start to transpire but the roots are unable to take in replacement water from the frozen soil, causing the top growth to dry out, resulting in dieback. This problem can also be aggravated by wind which also results in moisture loss from leaves and shoots. When we see the soil in our bonsai pots is frozen in winter, it is easy to think likewise that the tree itself is frozen. 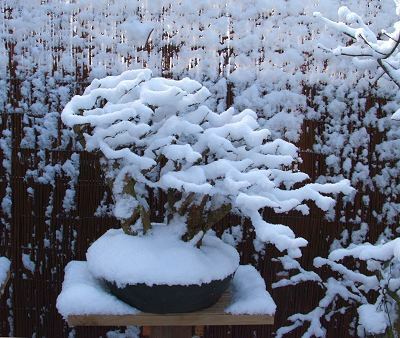 In fact, it is the water in the soil that is frozen, not the soil and importantly nor the roots of the bonsai itself. If the roots of the bonsai were to freeze, it would be fatal. During the Autumn, the tree stores a mixture of sugars, sugar alcohols and proteins that act as an antifreeze, so whilst the water in the soil may have crystalised into ice, the tree itself is still fluid. It is not until the temperature of the soil drops below -10°C that there is a threat of the rootsystem freezing. There is a variation in frost-hardiness between different species of trees and naturally shallow-rooted trees such as Azaleas are hardy to far lower temperatures than species that are typically deep-rooted. Some species such as Trident Maples and Magnolias are more susceptible to frost damage and protection from temperatures warmer than -10°C should be given. When outside air temperatures drop below -10°C, the pot needs to be afforded some protection to stop the temperature of the soil dropping to the same level. The temperature of the bonsai soil should be stopped from dropping by placing the tree and pot in a covered shelter. An unheated outhouse such as a shed or garage provide the best protection, but well insulated cold-frames or covers can also be adequate. Soil temperature can also be protected by mulching the pot or putting the tree back into the ground, though this is not generally as effective. These measures may not stop the water content of the pot from freezing, but will reduce the drop in temperature and stop it falling below the point where root damage occurs. The most reliable way to measure the effectiveness of your winter quarters is to place a thermometer alongside your trees to measure the degree of protection afforded against the outside temperature. 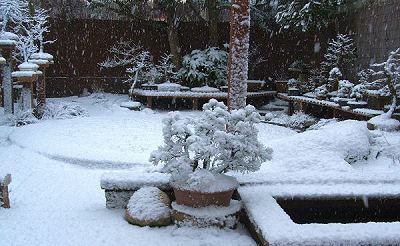 My experience of placing trees in an unheated garage, is that although temperatures will occasionally drop below freezing inside the garage, when outside temperatures dropped to -10°C for three days during the winter 2000, the temperature inside the garage never dropped below -4°C; well above the point where damage can occur. Placing especially vulnerable trees inside a cold frame inside the garage, reduced this drop to just below freezing. Winter protection should also include protection from strong winds and sun during periods when the soil is frozen and the roots are unable to replenish moisture that would be lost from the effects of direct sunlight and wind. The tree should not be placed anywhere that would allow the soil to warm up too much, placing the tree in a heated room temporarily for instance could bring it out of dormancy. Trees are brought out of dormancy when exposed to temperatures above 10°C for a number of days. Frost is created when the ambient air temperature drops and and as a result ground-level warmth rises to be replaced by the ‘heavier’ colder air. When the air immediately above the ground drops to 0°C, the ground itself freezes. Covering your trees provides a physical barrier that stops the warmer air surrounding your trees from rising, which in turn lessens the effect of the outside temperature. It is not possible for cold air to displace warmer air; if the warmer air is retained, the cold ambient air is unable to enter the quarters. Though the air under the covering can and does eventually drop below 0°C it will still remain warmer than the outside temperature. The thicker the covering over your trees, or the more layers of covering you use, the more difficult it is for the warmer air to escape. Fungal spores and small pests can also benefit from your trees’ frost protection by overwintering in and around the tree itself and the pot. Ensure that all leaves and other debris on the surface of the pot and in the branches is cleared away. Remove all cobwebs and look out for small insects, in particular scale insects. Clean off all algae from the trunk and remove any mosses growing on the surface of the soil. Moss can be placed outside during the winter ready for re-applying in Spring. Pests that are harboured overwinter can rapidly increase in numbers during warmer periods of the winter and particularly in Spring, causing damage that can go unnoticed until trees are brought outside in Spring. Although the general climate and weather condition cannot be altered, there are micro-climates around your house and garden that can be taken advantage of when considering winter protection. It is possible to have a wide range of variation in microclimates around your back garden or yard. Walls and hedges or overhanging plants will of course result in less light, but will also reduce the amount of rainfall and wind that a bonsai will be subjected to. The effect and risk of frost though can be increased or decreased by these factors. Frost will always drop to the lowest point it can find in the garden where it will create a frost pocket, physical barriers to the downward flow, such as walls, will trap the movement of the cold air and can lead to frost pockets at the base of walls. On the other hand, walls at the top of slopes and particularly house walls tend to be slightly warmer places which can be less affected by frosts and icy conditions. Careful observation of different areas of your property during adverse conditions will highlight places that are advantageous for placing your trees and/or constructing winter quarters. Your bonsai should never be allowed to dry out and this can happen during the winter when trees are placed in protective quarters out of the rain. Water consumption is however very low during the dormant period and the soil should be kept damp but never sodden. Trees that are left out in the open can be at risk from overwatering during prolonged periods of rain and also from melting snow. Trees that are sat in overwet compost all through the winter can suffer from root-problems associated with overwatering. Always ensure your soil mix is free-draining to avoid these problems from the outset, but, if during the winter a tree is found to be standing in poor-draining or overly wet soil, try to move it to the side of an outhouse or wall against prevailing winds where it will receive less rainfall. Deciduous trees have no requirement of light once their leaves have dropped. There are however many differing views on the requirement for light during the winter of evergreen species. The requirement of light in evergreen species is temperature dependant; the rate of photosynthesis drops as the temperatures approach freezing. At temperatures below freezing, photosynthesis does continue but excess light can actually start to cause damage, an effect known as ‘photoinhibition’. In conifers and other evergreens, exposure to direct sunlight during periods of sub-zero temperatures can cause damage though this is repaired during the growing season. A balance has to be struck when overwintering evergreens, light is still required through the winter as photosynthesis still takes place but strong light or long periods of direct sunlight should be avoided during periods where temperatures are below freezing. During periods of temperatures below -10°C, evergreens can be stored in near dark with no adverse consequences. Trees start into growth in the Spring when temperatures rise above 10°C for a period of days. They are not prompted by increases in light levels. It is important that as trees start to grow they are placed back outside where they have access to light. However, late frosts in Spring can devastate tender new growth and on nights where frosts are forecast, temporary protection must be afforded. Allow your trees to enter dormancy and harden to the cold. Store your trees somewhere that will remain above at least -10°C all winter. Optimally, temperatures will remain between 0°C and 9°C, though temperatures just below freezing down to around -10°C will cause no damage. Keep your trees out of direct sunshine and strong winds when the soil is frozen. Do not allow the compost to dry out, nor allow to stay overly-wet, it should always remain evenly damp. Preferably, in areas where night frosts are rare and seldom drop below -5°C, it is better that trees are left outside in a position where they are protected against damage from excess rainfall and wind. To be cautious, if temperatures threaten to drop below -5°C during the forthcoming day or night, temporarily use winter quarters though temperatures down to -10°C could be tolerated.